In the summer of 2011, the Arcola Branch Library, 49th in the network of 49 neighborhood libraries, opened on the site on an abandoned drive-in movie theater. Forty years of blight was finally replaced with county government’s $4.525 million investment in the future of Liberty City. The story below was one of the repercussions of $7.4 million drained from the library system ‘s 2009-10 budget the year before. The library’s money was granted to a list of organizations that provide high end art exhibits and concert series.Taxpayers had no say in the decision that library hours and library programs such as free tutoring were being cut. 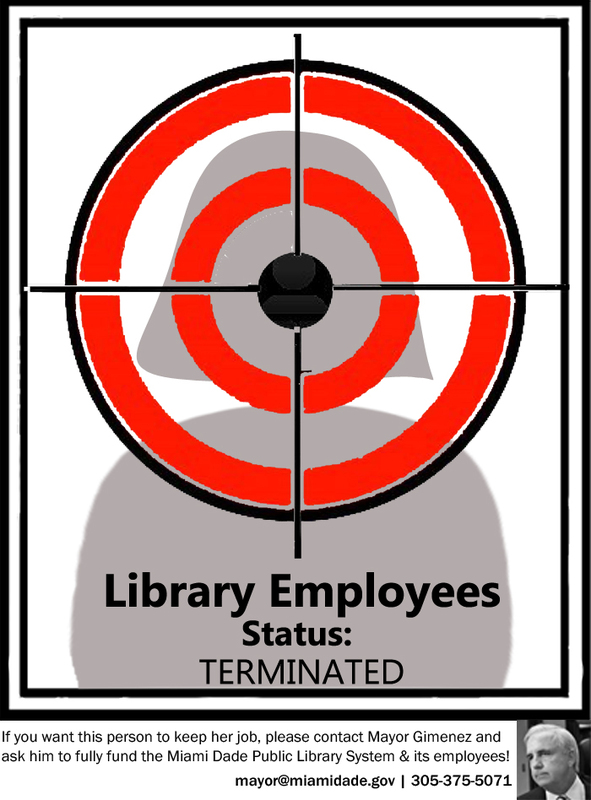 The 250 library staff affected went quietly. The public, for the most part, only thought that the library system had hours reduced. Here’s how it felt for one of the survivors as he prepares to be a victim of the next tidal wave of 192 layoffs. A pat on the back and a kick in the teeth seldom come on the same day. Although the library staff knew they’d be coming close together. We were waiting for them both. But not on the same day. It was supposed to be our day of triumph. We were opening the new library for Arcola Lakes. We had given one of the poorest neighborhoods a state of the art library that would be envy of the richest. The people swarmed this palace of self-improvement filled with brand new books, brand new computers, brand new furniture, brand new everything. In one month we had gone from bare walls and bare floors to this. Soon, we were helping everyone, from hard-working immigrants trying to keep up with USCIS paperwork to young mothers needing advice on helping their child stop struggling with reading. And today was the grand opening. There was the mayor, the county commissioner, our library director and half dozen other VIPS. Several classes of children from Arcola Lake Elementary came with their teachers. Even my old high school teacher, now a school librarian herself, was there to see it. The speeches were said. The applause, but not the glow from the achievement, faded away. The mayor shook my hand. He shook all of our hands. The VIPs left. Everyone relaxed. They came with the layoff letters. A demotion for my manager. A termination for my new Trainee. Transfers for some of the rest. We were honored for our effort, then scattered to the four winds. All on the same day. It hurt but until this July I counted myself lucky and felt my fate was hard but someone had thought it necessary to keep the library intact. The library would go on and I would still able to serve. We would still get the job done. Mine must’ve been the easiest letter to hand out that day. I could live with this. But I was sad for my manager. We had all worked with dogged dedication when things were grim,and with great enthusiasm when they were not. But more than all the rest, she had poured her heart into that library. It was not just a building or a collection. It was seen as an opportunity to affect the future course of the community She was a great manager. She deserved better. They all deserved better. So, we took the severe layoffs two years ago with barely a murmur and little public action. And this year, we just cannot. We cannot be silent or silenced. Because then, as bad as it was, only our own jobs were at stake, and not the library herself. Self-interest is not enough to get a librarian to rally in the streets. This year is different, like night and day. This time they’re gutting the library and stuffing her carcass with empty promises. On the outside the library will look almost the same. But when people go inside to order a book or ask for computer help they will find that little remains but rags and bones. All too often they will walk up and the doors will simply be closed. Our county mayor wants to save the “footprint of the library”. A footprint is good to look at but not much else. A footprint is a memory, nothing more.